Italian Prime Minister Giuseppe Conte declared on Wednesday (15 August) a state of emergency covering the region around Genoa after a bridge collapse killed 39 people and severed the port city’s mainland corridor with southern France. Conte, speaking at a news conference in Genoa, said he made the declaration after a request from regional authorities. He also took aim at toll-road operator Autostrade, a unit of Milan-listed Atlantia group, which operated the bridge as part of a stretch of the A10 motorway it manages. Conte said the firm had been responsible for ensuring safety on the bridge and the government would not await the outcome of a current criminal investigation into the disaster before taking action. Earlier, the Transport minister Danilo Toninelli said the firm’s A10 motorway concession should be revoked and hit with heavy fines. Rescuers searched for survivors amid the debris of Italy’s bridge collapse on Wednesday as the death toll climbed to 39 and the government blamed the bridge’s operator, demanding resignations and moving to strip its toll concession. 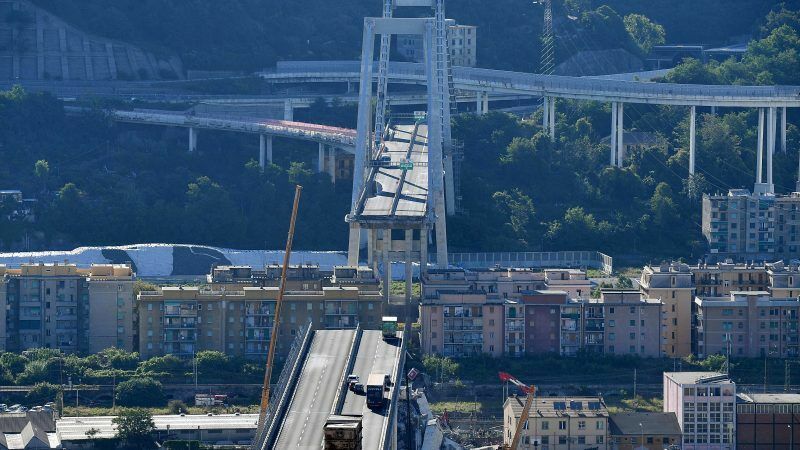 The 50-year-old bridge, part of a toll motorway linking the port city of Genoa with southern France, collapsed during torrential rain on Tuesday (14 August), sending dozens of vehicles crashing onto a riverbed, a railway and two warehouses. Bridge operator Autostrade, a unit of Milan-listed Atlantia group, said it had carried out regular, sophisticated checks on the structure before the disaster and that these had provided reassuring results. But the condition of the bridge and its ability to sustain large increases in both the intensity and weight of traffic over the years have been a focus of public debate since Tuesday’s collapse when an 80-metre span gave way at lunchtime as cars packed with holidaymakers as well as trucks streamed across it.